Karandila Orchestra was formed in 1994 and its debut performance was at Romfest, in Stara Zagora/Bulgaria, in the same year. The orchestra was named after a place called Karandila (the word is of Turkish origin), which is a beautiful park area near Sliven. The orchestra's source of musical inspiration includes a repertoire of oriental, Arabic and Turkish tunes introduced to Bulgaria by Ottoman military orchestras, as well as Armenian and Karakachani melodies. However, its greatest influence is Balkangypsy and traditional Bulgarian music. trumpet player from Sliven, Angel Tichaliev was to revive the spirit of traditional Bulgarian brass bands and at the same time revolutionize the traditional sound by adding a hint of the modern. Today Karandila's sound is one which is diverse and includes a wide range of styles and may lead one to believe that the origins of the marching bands of New Orleans are rooted in Balkan music. However its melodies are rich in compositions that include some Bebop, lots of Swing and strong oriental groove. The rise of Karandila was swift. Its music was successfully presented by Milan Ognyanov for the documentary film "Gypsy Summer" co-produced by the French Canal+. 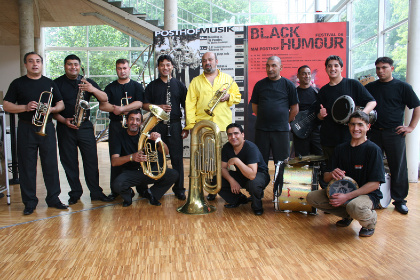 In 1999 the orchestra took part in the prestigious "Jazz Across The Border" Festival in Haus der Kulturen der Welt, Berlin. In 2000 it took part in the Italian leg of Goran Bregovic's European tour. Soon after the orchestra played in and toured almost every European country, from Antwerp to Prague and from Stockholm to Palermo. 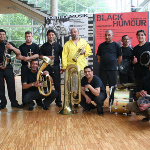 It represented Bulgaria in such prestigious festivals as "Europalia 2002 Bulgaria" in Belgium in the autumn of 2002, where the orchestra gave no less than seven performances. 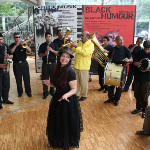 In 2002 the popular and talented singer Anita Christy joined the orchestra. (Anita is the niece of the legendary Bulgarian clarinet player Ramadan Lolov, who was the first musician to record traditional Bulgarian music on a 78rpm shellac plate). Karandila plays original music from which popular musicians such as Goran Bregovic and Boban Markovic have drawn inspiration. Listeners will be inspired by the originality and wholesomeness of the band's sound.